In Penn Yan, NY, commercial vegetable grower Nelson Hoover does not own a car, a computer or a PhD. In fact, as a member of the Groffdale Conference Mennonites, Hoover’s formal schooling ended after eighth grade. But, for over a decade, the 28-year-old has been at the forefront of vegetable growing innovation in the Finger Lakes region. He’s also one of the Cornell Vegetable Program’s (CVP) most trusted research and outreach partners. 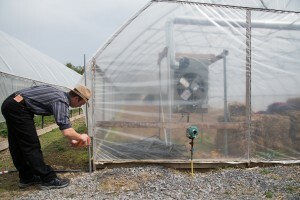 Nelson Hoover, a Mennonite farmer from Penn Yan, New York who conducts research trials with Cornell Cooperative Extension educators, waters grafted tomatoes in one of his two greenhouses. Sitting on just 3.8 acres, Hoover’s tidy five and a half year old farm is just a stones throw from rolling hillside vineyards that overlook Keuka Lake. Pulling into the driveway, visitors are greeted by a modern barn that houses a horse and buggy. Across the driveway, a swing set where his two young daughters play stands next to the entrance of the family home. A pair of cats wander about. Behind the barn sits the heart of Hoover’s growing operation: a trio of plastic-covered, climate controlled high tunnels. 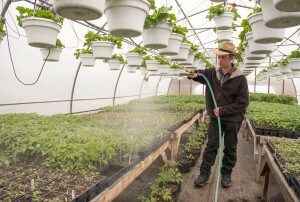 Spanning 30 feet wide and stretching more than 100 feet long, the tunnels along with his two greenhouses lengthen Hoover’s growing season and give him more control over the production process. In addition to bringing his own fruit to market, Hoover specializes in starting early-season plants for other commercial growers. This past March, he sold plants to growers from as far away as the Ohio-Kentucky border. 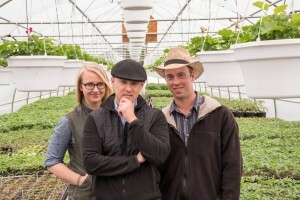 Cordelia Hall and Judson Reid (center) of CCE’s Cornell Vegetable Program collaborate frequently on research trials with Penn Yan, New York Mennonite farmer Nelson Hoover. They also make him an ideal research partner for CVP. A Cornell Cooperative Extension regional agriculture team, CVP assists farmers in 12 western New York counties—the largest vegetable producing region in the state–by helping them apply Cornell research and expertise to their local growing operations. Two of those counties, Yates and Seneca, are home to high concentrations of Old Order communities. Within these communities, Amish and Mennonite vegetable farms have experienced significant growth in both numbers and influence in recent years. They now operate 99 percent of the dairy farms in the area, and a Mennonite-run produce auction is the region’s largest. Working to maximize vegetable quality and output in Yates and Seneca Counties is Reid, who specializes in small farm operations and high tunnel growing. Over the years, he has become one of the region’s most trusted agriculture education voices–even within those communities typically separate from outside influence. One of the keys to accessing that street has been Reid’s successful work with Hoover, with whom he conducts two to three research trials a year. 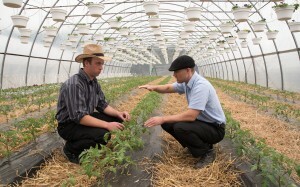 Old Order farmer Nelson Hoover and Cornell Vegetable Program Educator Judson Reid evaluate a high tunnel tomato plot at Hoover’s Penn Yan, New York farm. Together, Reid and Hoover have conducted trials in areas such as pest management, disease resistance and crop revenue maximization. A recent project examined optimal practices for growing hanging baskets of flowers in combination with tomato plants. The success of those trials also has mutually benefitted Nelson and CVP. And it’s also helped Reid and his colleagues build credibility with other Old Order farmers. Reid recognizes, however, that data points alone are not enough to earn buy-in from practitioners of Old Order faiths, and he’s spent years studying the customs and conventions of Amish and Mennonite cultures. Most of his breakthroughs, though, can be traced to a willingness to roll up his sleeves and get his hands dirty. “Early in my career, I would spend entire days on Amish and Mennonite farms pruning and harvesting tomatoes right alongside the growers like Nelson’s father,” says Reid. “That led to getting invited in for a meal or to sit down for a cup of coffee on the porch and laid the groundwork for more involved interactions down the road. Penn Yan, New York vegetable farmer Nelson Hoover adjusts the height of a sidewall on one of his three high tunnels. The tunnels are frequently used to conduct research trials with Cornell Cooperative Extension educators. Like all tunnel growers, Nelson Hoover is focused on expanding and maximizing his spring and fall growing windows. But he also puts a lot of effort into improving the high tunnel soil during the winter. To help facilitate that, he grows winter grains such as barley and triticale. For Hoover, cover crops represent a vital step in protecting the indoor soil that supports his livelihood. “Soil care is supremely important to me and cover crops are a big part of that,” he says. “I’ve found that the triticale is good for feeding the biology of the soil, managing its nutrients and the addition of vegetative material improves its physical state. R.J. Anderson is a communications specialist/staff writer for Cornell Cooperative Extension. The dynamic of these two men working together, farmer and extension specialist, is based on the personal integrity of each person. There is a direct connection between what they say and what they do.